First things first: Yes, Hyland is still hosting the sports bar. 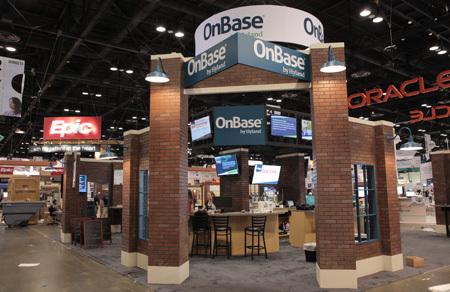 The perennially popular booth (#3668) on the HIMSS15 show floor will be serving up suds and snacks each afternoon in addition to showcasing the latest advancements for Hyland's OnBase enterprise content management platform. "It's a new and improved sports bar," Susan deCathelineau, healthcare solutions manager at Hyland. "It's getting a little bit of a makeover." Also new and improved is Hyland's product line, which this year will be touting, among others, new image archiving and mobile access technology. "We're further expanding our clinical content strategy," says deCathelineau. "Oftentimes people think of what we do as scanning documents – which is a big piece of getting rid of the paper. But we do a lot of ingestion of content around EKG results, digital photos, being able to take content that's already electronic – and keep it electronic. "We don't want people to just print something out and scan it," she adds. "We want to be able to ingest it directly from the host system. That’s the direction we've been going – expanding that ability to capture different types of content and make it available for the user when they need the information." Hyland, which recently earned a 'Best in KLAS' award in the Document Management and Imaging category, sees the ability to intake different types of content with different clinical systems – "being able to take those digital photos, those electronic results and being able to capture them in OnBase and present them through their EMR integration" as critical to effective care delivery, says deCathelineau. Part of that is "the ability to integrate with medical imaging viewers," she says. Toward that end, Hyland will be launching new vendor neutral archive technology at HIMSS15. "We have traditionally not captured medical images, (but) we now have the ability to view those images through our integration with electronic medical records, as well as now archive those images through our VNA solution," says deCathelineau. "The direction is for healthcare organizations to better manage the lifecycle of their content," she explains. "That archive provides them the ability to archive both DICOM and non-DICOM content – to really be an archive for all content, and then to be able to have the lifecycle around retention, the integration to the line of business applications specific to the roles of the end users who are accessing that information." Equally important as being able to access and view? The ability to share. "We have a solution called OnBase Anywhere, in which you can share content from one health system to another," she says. Providers "are looking for greater access," she adds, and "people want to be able to use their mobile devices." The past decade or so has seen a steady evolution, with "more sophisticated end users and more sophisticated patients," says deCathelineau. "Providing access to the right information at the right time with the device the end user wants" is critical. Hyland will be hosting a breakfast session on just that topic, with a talk titled, "Greater Patient and Provider Satisfaction with an Image Enabled Patient Record," presented April 14 from 6:45-7:45 a.m. in McCormick Place Room S504 A.